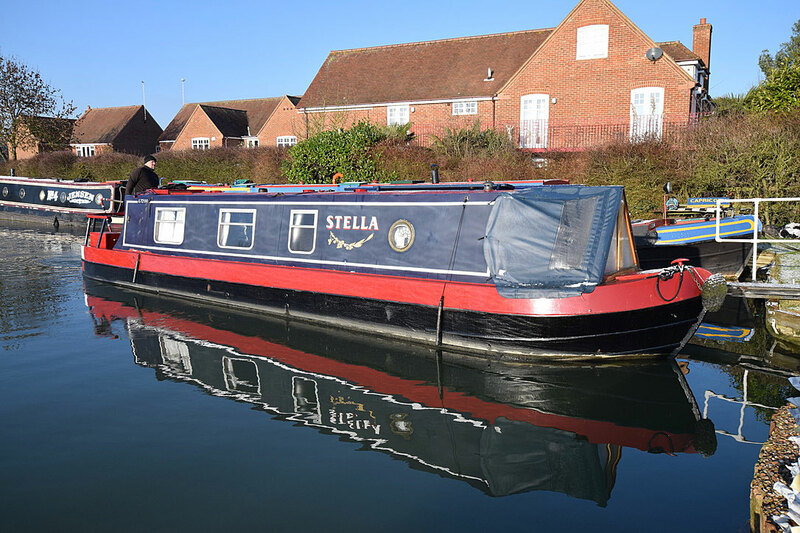 Stella – 36′ reverse layout cruiser stern – is a lovely little cruiser stern boat built by Colecraft in 1990 and cleverly fitted out as a hire boat by Kate Boats of Warwick….at 36 and a bit feet, the space she offers within the length is hard to fathom. A good sized rear deck has a taff rail with seats surrounding it – a lovely social space on a warm day. Entering the boat via the rear doors you find the first of several clever ideas. The steps fold in half to create an extra seat or base for a cross bed formed from the bench seats – it is possible to seat 8 in this area!! Lots of storage under the seats along with the 2 way calorifier. A drop leaf dining table is cleverly stored behind the Arrow stove. TV point and car stereo are also in this area along with 12v charging points and sockets. The galley is compact but light and airy. A small oven/burner combi has been fitted with storage underneath and shelves over. The fridge works off 12v/240v and gas. Cupboards run the length of the port side to the bedroom. The bathroom is next, featuring a posh portapotti and shower cubicle along with a built in vanity unit. The door is a sliding one. The main bedroom is next; another clever piece of design allows the full length of the room to be a double bed, a square panel lifts out to reveal the step to the front door. The covered glazed cratch area features two storage lockers which are also seating. Forward of this is the gas locker. A characterful and tidy boat in good condition, with masses of storage space for the size, ideal for either a family holiday boat but could also very easily be a comfortable liveaboard.